Above scan is of the back cover of no. 42 (dated Oct. 16, 1943) of Turkish children's weekly magazine Çocuk Haftası [Children's Week], featuring the first installement of the comics serial 'Boğaç Han' by Turkish artist Ekrem Dülek. 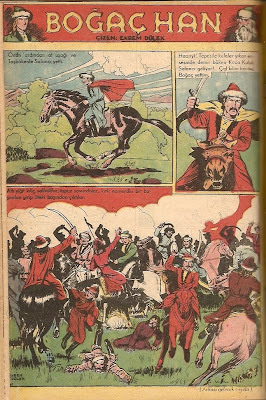 The first Turkish comics artist (who received printed credit for his work) was Orhan Tolon who had worked extensively in the 1930s, creating several series of humorous juvenile adventure strips, most of which had utilized speech balloons. 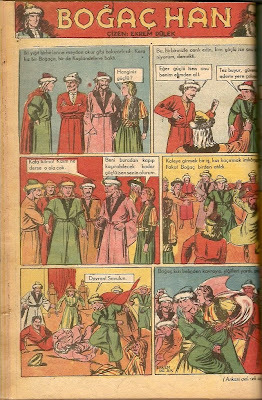 However, when he made his first realistic non-humorous comics, the historical epic 'Deniz Kurtları' which preceeded 'Boğaç Han' in Çocuk Haftası in the earlier issues of this magazine, he had curiously resorted back to the format of extra-panel text captions, omitting the use of speech balloons and captions inside panels. 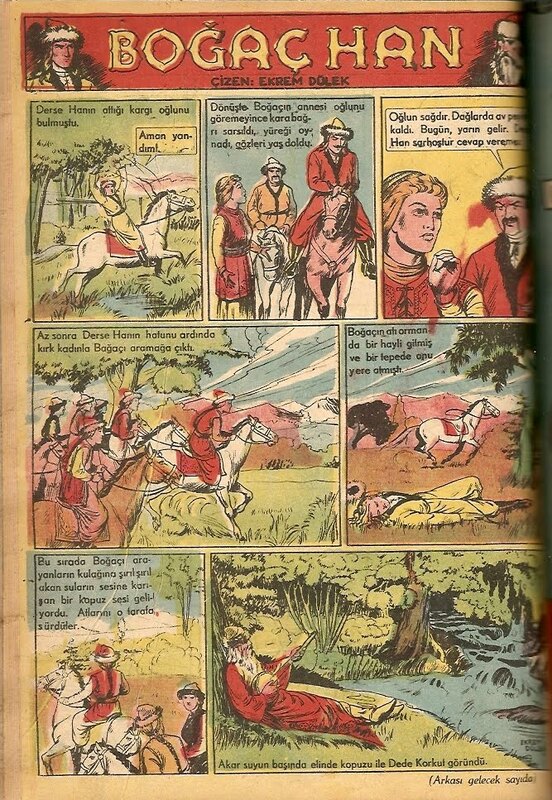 'Boğaç Han' became the first non-humorous Turkish adventure comics utilizing speech balloons (actually, speech 'rectangles', as can be seen in the above scan) and captions within the panels without resorting to extra-panel text captions. The bearded person in the last panels as well as in the right side of the logo is a depiction of Dede Korkut, the wise old man who comments on the developments -the compiler and narrator of these mediveal tales collectively known as 'Dede Korkut Hikayeleri [Dede Korkut Tales]'. 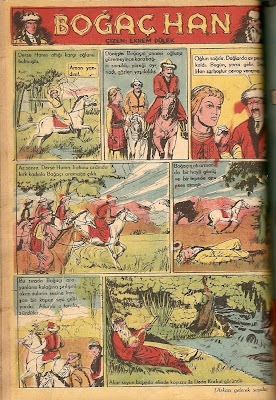 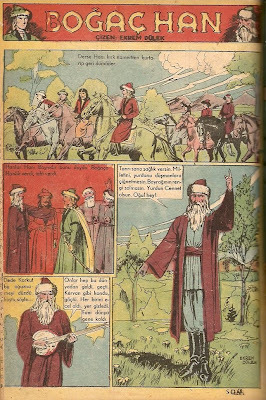 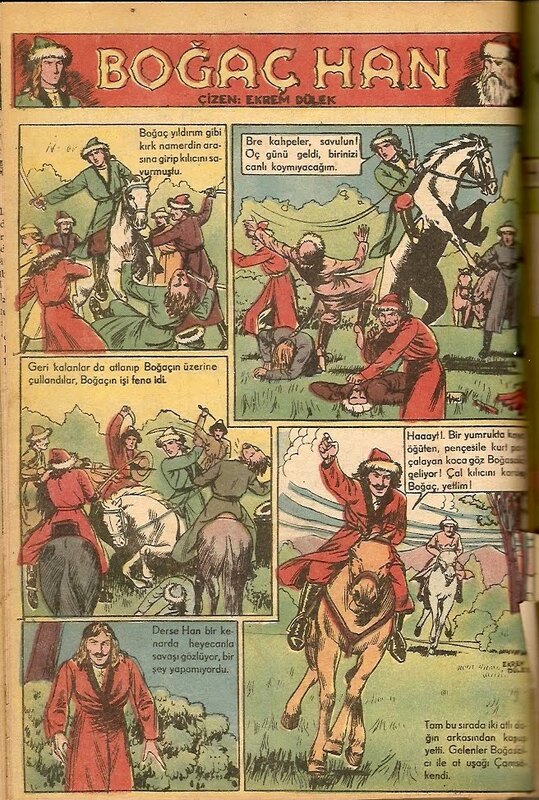 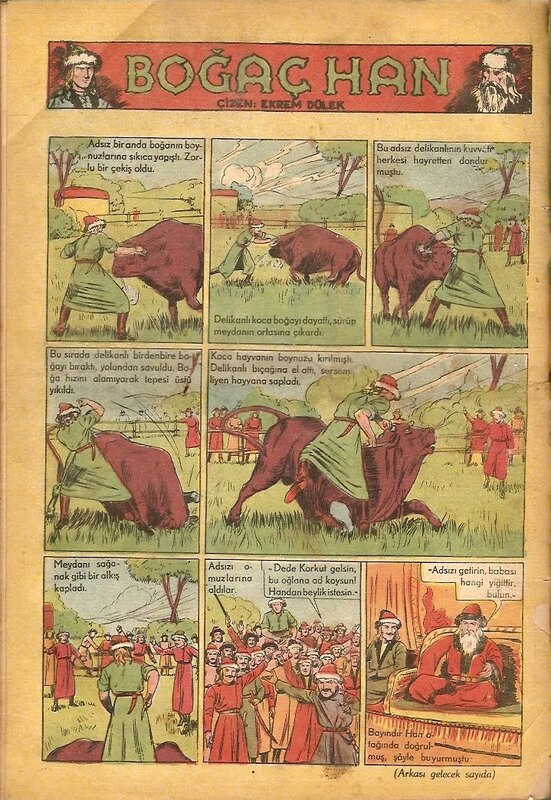 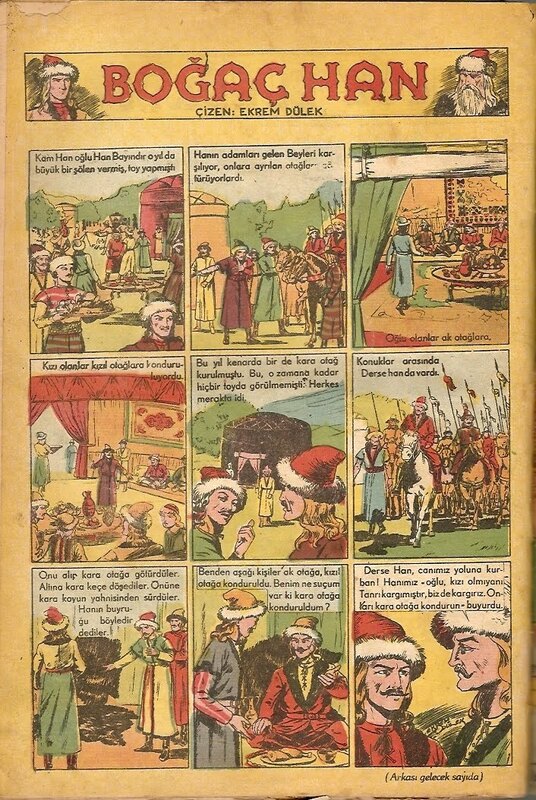 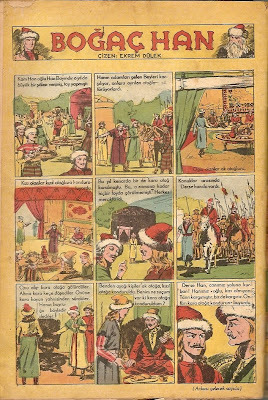 Subsequent issues of Çocuk Haftası, which lasted till 1950, included several other comics, some of which were based on other Dede Korkut tales, by new Turkish artists such as Sururi Gümen, Mehmet Tekdal and Şahap Ayhan besides foreign material such Felix the Cat, Prince Valiant and some Yugoslavian comics. 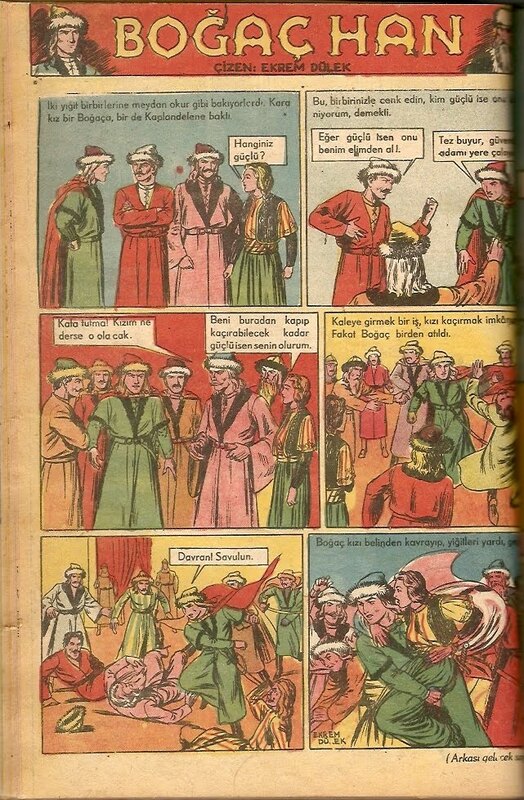 Çocuk Haftası was published by Turkish print media mogul Tahsin Demiray (see post on Oct. 25, 2009 for info on Demiray) and edited by Rakım Çalapala.